Is an FFL required to ship a long gun out of state? Can you use the U.S. Mail to ship firearms? Can you ship guns directly to a manufacturer for repairs? Answers to these and many other questions are provided in a convenient Firearms Shipping FAQ created by Gunbroker.com, the leading online firearms auction site. The article does a decent job summarizing applicable Federal law and includes handy links to the statutes themselves so you can read them word for word. 48″ MidwayUSA ‘Quick Ship’ Box, #897166, $15.99. A foam-lined double-cardboard box offers some protection for your firearm. But we recommend you put valuable pistols and long guns in a sturdy plastic or metal hard case, INSIDE a cardboard shipping container. Make sure the contents can’t move around inside the box. Always insure for full replacement value (including tax and transfer fees). Photograph the gun BEFORE it’s shipped so you can document its original condition should it arrived damaged. We find that folks are often confused between the rules for handguns and long guns. Handguns may NEVER be shipped through the U.S. Mails unless you are an FFL holder. By contrast, a “civilian” (i.e. non license-holder) CAN ship a rifle or shotgun via the U.S. Postal Service. 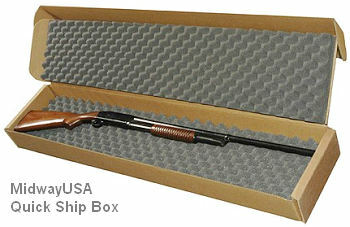 In fact the USPS may be the most economical and reliable shipping choice for long guns these days. 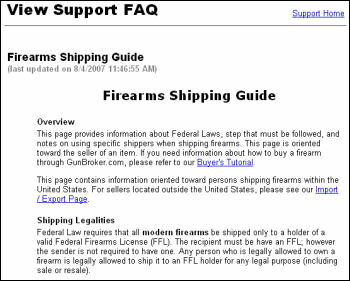 Share the post "Firearm Shipping FAQ"